H.C. (for Harold Charlesworth) Grimshaw was an active researcher at the U.K.’s Safety in Mines Research Board for many years – from at least the 1930s to the 1960s – and published a number of internal reports and other articles on the results of his work. He was apparently from the Manchester area and served his country during World War I. He graduated from the University of Manchester with a Bachelor of Science degree in Chemistry in 1921 and with a Master of Science degree in 1922. His earliest identified publication for the Safety in Mines Research Board was in 1931. It is probable that he was descended from the “Audenshaw” Grimshaw line (see companion webpage); a potential candidate has been identified from that line as H.C. Grimshaw. The following publication was reviewed at the Library of Congress in August 2008. 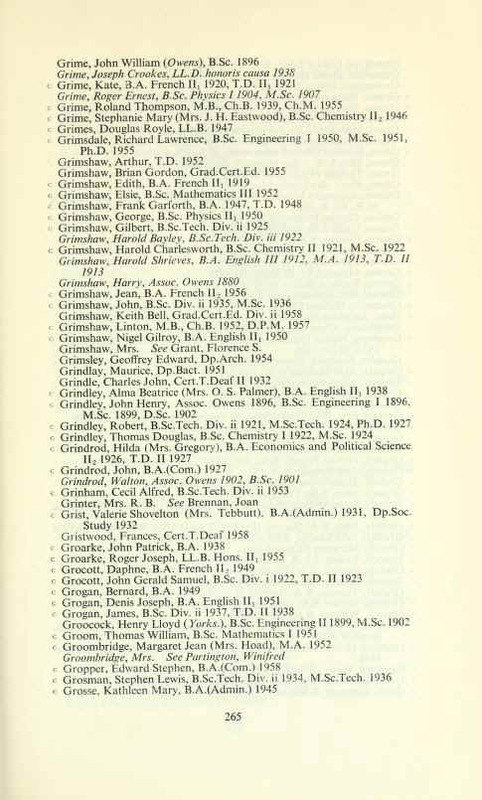 The British Library has at least 11 Safety in Mines Research Board Publications that were authored or co-authored by H.C. Grimshaw. The online catalogue entries are shown below. 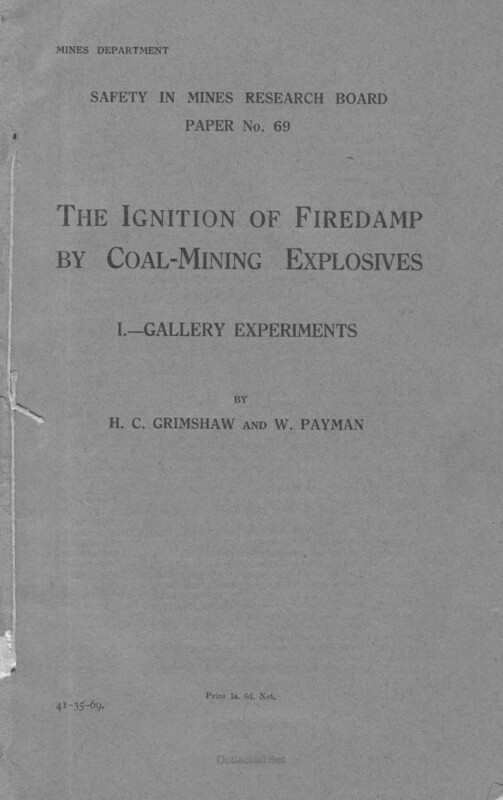 Author – personal Grimshaw, H. C.
The ignition of firedamp by coal-mining explosives. 1.Gallery experiments / By H.C.Grimshaw and W.Payman. Added name Mines department. Safety in mines research board. Author – corporate Safety in Mines Research and Testing Branch. The Development of safer mining explosives. [S.l.] : Ministry of Fuel and Power, 1950. Added name Shepherd, W. C. F.
Added name Ministry of Fuel and Power. Added name HARDY, V. O. Author – corporate Safety in Mines Research Establishment. Slow Burning of permitted explosives as a possible cause of hangfires or delayed explosions. [S.l.] : Ministry of Fuel and Power, 1951. Added name Grimshaw, H. C.
Applicability of Short-period delay detonators in Safety-Lamp mines. [S.l.] : Ministry of Fuel and Power, 1952. Procedures for Assessing the relative safety of explosives and of coal dust/Inert dust mixtures by means of gallery experiments. Added name Gibson, J. W. [S.l.] : Ministry of Fuel and Power, 1954. New Testing procedure for Eq.S and Sheathed explosives. The relative ignition risk of coal dust clouds by permitted explosives. [S.l.] : Ministry of Fuel and Power, 1956. Tests of the Hurricane Stemmer. Added name Ministry of Power. Safety in mines research establishment. The influence of cannon wear and other variables on the probability of ignition of methane-air in a cannon test of coal-mining explosives / by W.L.Murray,G.Fogg and H.C.Grimshaw. Safety in Mines Research Establishment, 1965. Harold Grimshaw served in World War I in the “16th Bn. Manch. 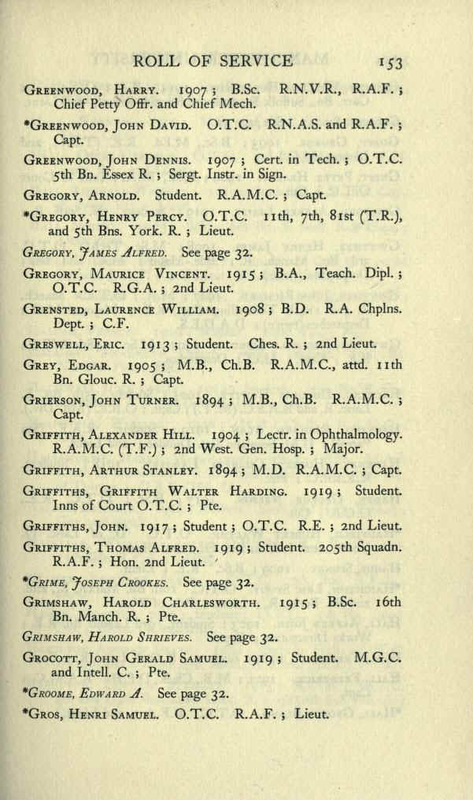 R.” in 1915, apparently as a Private (Pte.) as shown in the following publication. 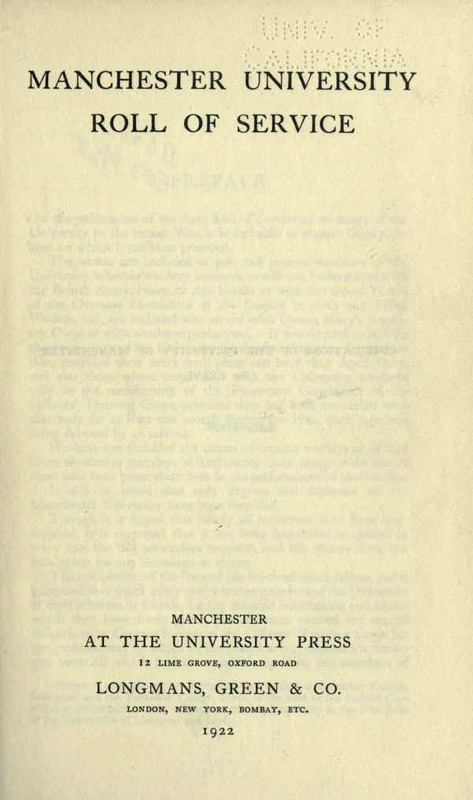 Author unknown, 1922, Manchester University Roll of Service: Manchester, UK, Manchester University Press, p. 153. 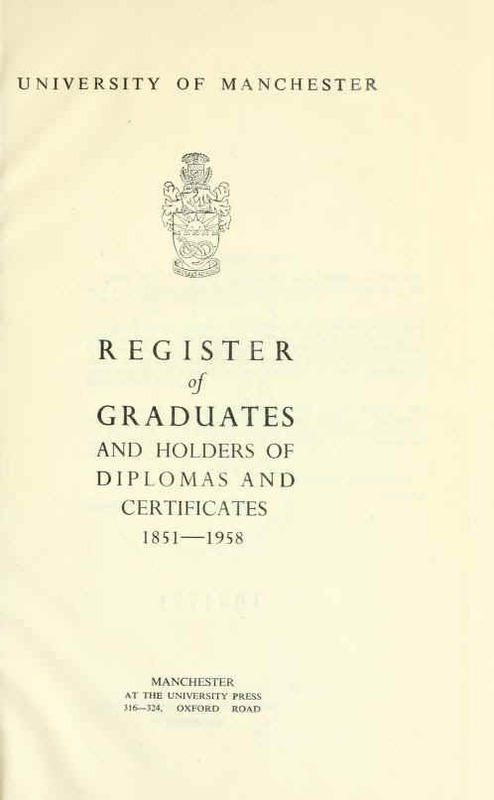 Harold received a Bachelor of Science degree from the University of Manchester in Chemistry II in 1921 and a Master of Science degree just one year later, in 1922, as shown in the following publication. H.C. Grimshaw is probably descended from the Audenshaw Grimshaw family line (click here for a companion webpage). A candidate has been identified in bold in the descendant chart below. The name, location and birthdate are appropriate, but it is not known if this is the correct individual. The descendant chart is from information provided by Norman Grimshaw. See Harold in bold font below. Birth, location and name are about right, but…. William Grimshaw (1765, Lancashire – ?) & Alice Hibbert (1768, Lancashire – ?). Married 17 Sep 1787, Manchester.